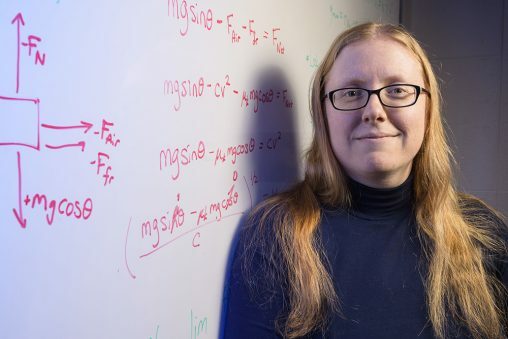 An extensive article on how inequity in physics is driving talented women out of the field, co-authored by Adrienne Traxler, assistant physics professor at Wright State University, has been published in the prestigious Physics Today. The membership magazine of the American Institute of Physics is widely distributed and read. Titled “Gender Matters,” the article was written by Traxler; Jennifer Blue, an associate professor of physics at Miami University; and Ximena Cid, an assistant professor of physics at California State University. The article highlights studies that show systemic bias against women in physics, examines implicit bias and considers stereotypes about women and physics. It then outlines what physicists can do to improve things and offers resources. Traxler says only about 20 percent of the undergraduate degrees in physics go to women, far less than biology, chemistry and math. She said the lack of women in physics stems from factors that begin when they are very young girls. As young as age 5, she said, girls begin to be steered into fields in which hard work rather than a natural brilliance is required to succeed. Traxler said a Google search for “scientist” yields images of mostly men with Einstein-style hair often holding a beaker of chemicals. Women who choose to major in physics in college often have to endure discouraging remarks from male instructors. “There are still overtly sexist comments that female students get, that female professors get in terms of ‘You don’t belong here,’” said Traxler. Traxler grew up near Kokomo, Indiana. Her parents were very supportive of her pursuing any career she chose. She initially wanted to be an astronaut and later started thinking more of becoming an astronomer. In high school, she attended several summer science camps, one of them at Purdue University. After graduating from Tri-Central High School in Sharpsville, Indiana, in 2000, she attended the University of Maine on full scholarship to study physics. “The idea that there is this vast universe out there with these alien complicated processes going on that we nonetheless can understand by the rules of physics — I was really inspired by that and I wanted to be an astrophysics professor,” she said. During the summers, she taught physics in the Upward Bound program, helping low-income high school students bridge to college. That inspired her to seek a master of science in teaching, doing her thesis on student understanding of astronomical timekeeping. After graduating in 2006, Traxler pursued her Ph.D. in applied mathematics at the University of California, Santa Cruz, graduating in 2011. She then came back to physics education research, landing a job as assistant director of a Howard Hughes Medical Institute grant at Florida International University. It was there that she helped faculty transform their teaching to do more active learning in chemistry, biology and physics. She joined the faculty at Wright State in 2014. Traxler teaches Introductory Physics, Analytical Mechanics and Astrophysics. She is conducting research in quantitative network analysis and diversity and equity issues in physics education, especially gender. Traxler said getting more women into physics will help advance the field. Ways to increase the number of women in physics, Traxler says, include continuing research camps and other programs designed to attract young females to the sciences, raising the awareness of male physics professors about not making discouraging comments to female students and establishing a physical space where physics majors can gather with their peers so they can form their identities as scientists together. Traxler said getting the article published in Physics Today shows that people are interested in the equity issue. “People care more about this subject than they did 20 years ago, and that makes me hopeful for the future,” she said.